Ornithischia (/ɔːrnᵻˈθɪskiə/ or-ni-THISS-kee-ə) or Predentata is an extinct order o beaked, yerbivorous dinosaurs. The name ornithischia is derived frae the Greek ornitheos (ορνιθειος) meanin 'o a bird' an ischion (ισχιον) meanin 'hip joint'. Thay are kent as the 'bird-hipped' dinosaurs acause o thair bird-lik hip structur, even though birds actually belang tae the 'lizard-hipped' dinosaurs (the saurischians). 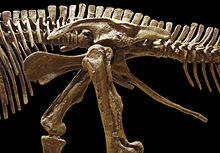 Some commonly kent Ornithischians include the horned dinosaurs (ceratopsians), armored dinosaurs (stegosaurs an ankylosaurs), Iguanodon, an the "duck-billed" dinosaurs (hadrosaurids). Bein herbivores that sometimes lived in herds, thay wur mair numerous nor the saurischians. Mony were prey animals for the theropods an wur uisually smawer nor the sauropods. This page wis last eeditit on 23 Dizember 2013, at 19:59.